Sheffield-based furniture designer Dan Schofield endows each of his creations with an individual story. While persistently allowing them to have an extended lifespan, he keeps suggesting ways to reduce their environmental impact as well. Just recently, one of his designs was awarded with first prize in the furniture category of the New Design Britain Awards at the annual Interiors UK event. Dubbed Shifty desk, the innovative desk flaunts a FSC Ash work surface that hides a secret storage area underneath it. Moreover, the desk offers itself as a perfect furniture item for small space living as users may slide the work area toward them when required. When not in such use, it serves as unique storage for personal papers and electronic equipment. 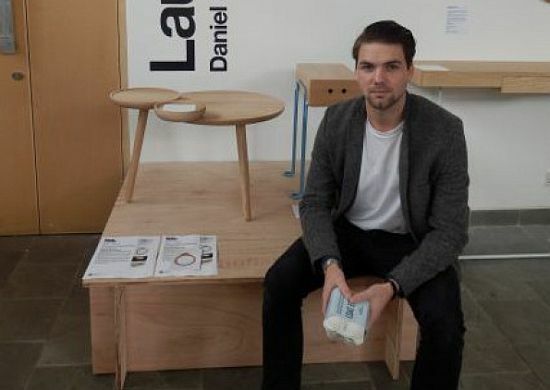 Dan owns a profitable furniture design business at Sheffield Hallam University’s Hatchery incubator. The acclaimed furniture designer had his designs exhibited at London Designers’ Week.